Darth Bane: Dynasty of Evil by Drew Karpyshyn came out yesterday. This newest Star Wars novel is the final chapter of an impromptu trilogy that began three years ago with Darth Bane: Path of Destruction. The unexpected success of that novel led to Karpyshyn getting tapped to write Darth Bane: Rule of Two, released a year later. 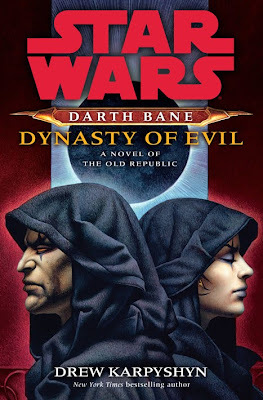 It's good to keep these things in mind while talking about Darth Bane: Dynasty of Evil because for a trilogy of books that may not have even been planned to begin with, this wound up being one of the most satisfying and thrilling arcs of storytelling that I've ever read from that great saga of a galaxy far, far away. And I'll reiterate something that I suggested in my review of Darth Bane: Path of Destruction three years ago: that the story of Darth Bane is one that I would absolutely love to see realized in a visual medium someday (and I'm still hearing Clancy Brown's voice coming out of Bane's mouth). For someone who started out as pretty much nothing more than a throwaway reference in the background story of the Star Wars saga, Darth Bane has certainly become one of the most intriguing and popular characters from the mythology. If this was all planned out, Drew Karpyshyn deserves to be recognized as among the top tier of Star Wars authors today. If it wasn't, then all the more reason why Karpyshyn should be so ensconced. His Darth Bane trilogy should be required study for any future author that might have the chance to write Star Wars. Darth Bane: Dynasty of Evil begins ten years after the events of Darth Bane: Rule of Two. Darth Bane and his apprentice Darth Zannah are still continuing the Sith order through the Rule of Two instituted by Bane: that there must always be only two Sith at a time. Master and apprentice. One to have the power and the other to covet it. Bane has been training Zannah since the day he found her on the battlefield of Ruusan. Fearing that Zannah might not be strong enough to carry on the Sith lineage and knowing that he won't live long enough to adequately train another apprentice, Darth Bane begins seeking out hidden and forgotten Sith lore. His search brings him to the story of Darth Andeddu: an ancient Sith who legends speak of discovering the means of immortality. Bane begins seeking out Andeddu's lair, believing that if he can find the means of staving off death for long enough, he can do away with Zannah and replace her with a more fitting apprentice. Meanwhile, a labor dispute on the world of Doan has spiraled into something darker when a Jedi sent to mediate between miners and the ruling families ends in the death of the envoy. Serra, the newly-widowed wife of the king's son, leaves for Coruscant on a diplomatic mission of reconciliation with the Jedi Order. It is at the Jedi Temple that Serra discovers a very terrible thing: that for all the boasting of the Jedi, the Sith are not extinct. 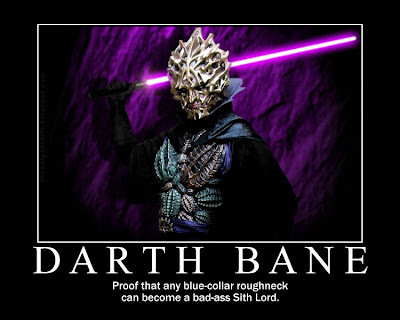 There is still one out there: the Sith Lord that killed Serra's father many years earlier. Darth Bane: Dynasty of Evil is a little less than 300 pages in length. The second half flies past with the blur of a lightsaber, and Karpyshyn deftly ties up all of the loose ends that we had known were there, as well as tidying up things that we perhaps didn't realize were still there to begin with. In short: it felt every bit like a classic Star Wars tale. And when Darth Bane and Darth Zannah meet for their final confrontation, Karpyshyn does not disappoint. We've known for the longest time how the Sith of the Rule of Two (the same Sith order that will a thousand years later produce Darth Sidious and Darth Vader) propagates: with the master intentionally training the apprentice to one day rise up to destroy him. This is the first time that we get to see how that happens. I think that Karpyshyn might have inadvertently created a whole new sub-genre of Star Wars storytelling with how masterfully he pulled off his Darth Bane trilogy and its final installment. We've got Jedi stories up to our armpits. With the arrival of Darth Bane: Dynasty of Evil, the Sith have satisfied us yet fittingly tantalize us with the promise of more. If you've read the first two Darth Bane novels, then plunking down coin for Darth Bane: Dynasty of Evil is a foregone conclusion. If you haven't already, then start with Darth Bane: Path of Destruction and prepare for a Dark Side treat from the days of the Old Republic. This is Star Wars tale-tellin' at its finest, and I hope that Lucasfilm will give Drew Karpyshyn plenty more opportunity to play with the saga in years to come! If only George Lucas would do what Bruce Timm has been doing with the DC Animated movies lately. Drew Karpshyn must write more star wars. This triology owned everything. I have read most of the S.W novels, I am IN LOVE with Darth Bane and the books... It did own, I am making my saber hilt curved )almost in dedication,) MOVIE? SOON? NOW? MUST READ! Just finished this book the other day, was curious for the thoughts of some other readers. Who won at the end? Seemed very open to interpretation, and there's no other stories yet down that timeline for us to go to. I'm hopeful they'll provide some more books from this timeline as it's been very entertaining.